Lydia Bennet. She’s naughty, she’s loud, she’s determined to expose herself as ridiculous and bring disgrace to her family in the process. In spite of these things, I relate to her in one intrinsic way. She’s drawn by the compelling figure of a man in uniform, especially a military uniform. She, of course, was particularly fond of the militia officer in his regimentals; the goal of encountering exactly that sort of person was the impetus for an excursion to Meryton. It took me a few readings of Pride and Prejudice before I caught the subtle nuance here. Perhaps swayed by the adapted versions that emphasized that Lydia and Kitty were the officer-crazed sisters, I totally missed the hint that Elizabeth, whose point of view carries the majority of the book, is also a bit enamored of men in uniform. It’s evident that Jane Austen was aware of the place military officers held in society. Closely tied to nobility and aristocracy, the upper-level officers were drawn from the elite strata of society. Even the lower officers were supposed to be landowners, and therefore, one could construe them to be eligible matches for the gentry. Things are not always what they appear, however, particularly in militia regiments. Members of the militia were not bound for foreign soil; they were the local peacekeepers. The commanding officers were typically titled and among the largest landowners in the county from which the regiment was drawn. They were given a quota to fill, with the station of officers fully reflective of the social and financial status of the members. Captain Carter was a much better marital prospect than Mr. Denny. As with almost anything, appearances can be deceiving. Those with the resources to do so could hire a proxy to serve in their place, and when the quota wasn’t matched by those who met the minimum standards, the powers that be allowed the standards slide a bit. Mr. Wickham, though not a landowner, was educated, gentlemanlike and attractive—all characteristics which would lend distinction to the regiment, so he was let in. What is less clear is how he paid for his uniform, which is an expensive proposition. When the fact that he isn’t a landowner, nor an heir to land becomes apparent, Austen lets her readers use their imaginations as to how he qualified. Militia regiments, though populated from a common region, never served in their home county. This was partly to prevent abuses of power and partly to prevent its members from being distracted by temptations of their familiar turf. The fact that Wickham has joined the regiment stationed in Meryton strongly implies that it is the Derbyshire militia stationed there. His connection to Pemberley would be known and respected, and one could surmise that this is how he got around the landowner requirement to be an officer. Military training, particularly for officers, does reinforce a commanding bearing, confident air, purposeful stride and disciplined behavior. These things, accompanied by a finely tailored uniform, brass buttons, gold braid and other embellishments of design combine to create the perfect storm for a young girl’s fantasies. Is it any wonder that when I first laid eyes on my husband and he was dressed in a work uniform that was military-esque, I found him completely charming? What say you? Do you love a man (or woman) in uniform? I don’t know how I missed this post, Diana, but I love it! I admit to loving men in uniforms because they are always so ‘put together’ not sloppy as some tend to be. Alas, after they get married some turn in the opposite direction! Heh heh At least that is what happened with my father. He was always so handsome in his uniform but when he wasn’t he didn’t try to impress anyone. He wore whatever was comfortable, much to my mother’s horror. I didn’t mean to get off on that, but it is the truth. Thank you for pointing out that Lizzy thought Wickham was handsome in his uniform, as I got that impression too. Excellent and fascinating information on a subject to which I had not given any thought, and totally agree that a guy in a uniform is hard to resist. My husband also served as an officer in the military for 6 years and in the Guard for 25. A uniform, of course, is meant to remove the person’s individuality. One year at the Governor’s parade held at Camp Williams, our daughter, age 8 at the time, went to stand by a man in uniform. I wondered what she was doing and called to her. She then looked up at the man and found that it was not her father. An interesting point, about removing a person’s individuality through a uniform. In a way, this very aspect is why Wickham is a wolf in sheep’s clothing. (Yes, their uniforms were wool, but that is not what I meant.) As an officer, and with the manners of a gentleman, assumptions were made about him that owed their foundation to his status as a lieutenant in the militia. As Elizabeth noted, he “had all the appearance of goodness.” Love the story about your daughter! Diana, This was such fun and so adorable. Thank you. It was a joy to read. Oh those Red Coats! I’m glad you enjoyed it, Barb! Oh, those Red Coats indeed! During his teenage years, until aged 18, our son was a member of the Sea Cadet Corps here in the UK. Although I’m probably biased, I have to say that he did look pretty good in both sets of uniform that they issued. He had a working set and a dress set. Each year, on Remembrance Sunday, he and his unit marched in the local Remembrance Day parade along with the Air and Army Cadets, and the local Army college. They all looked very smart in their dress uniforms. 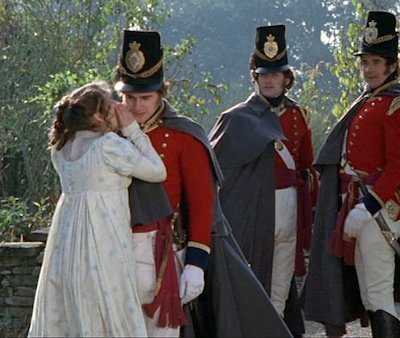 So yes, I do rather like a man in uniform and when it comes to period uniforms, I’m particularly fond of Richard Sharpe and Ciaran Hind’s version of Captain Wentworth. Oh, I just did a google image search on “Sea Cadet Corps” and they are one sharp looking youth corps! I have always believed that Mom’s get to be biased, especially when their kids are doing good things in the world, but I’m sure he did look every bit as good as you thought he did! I must add that you have excellent taste in your particular favorites! Thanks for a great post, Diana. 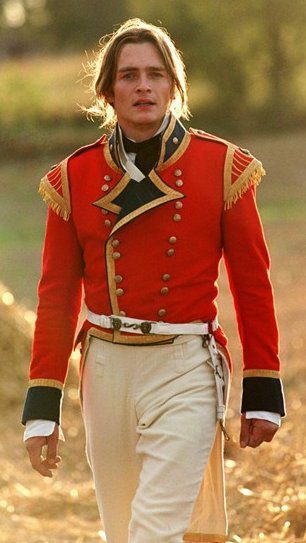 I’m terrified to notice there’s so much of Lydia in me 😉 But I guess there’s something fascinating about a man in a uniform, especially those flamboyant regimentals from Jane Austen’s time. They must have stood out in their red tunics and gold braiding! Compared to them the gents in subdued colours didn’t stand a chance. Like others who write JAFF or love Austen generally, I’ve spent a bit of time pondering her characters. P&P gives us some truly rich personalities to examine and Lydia is one of those for me. When you look at the attributes of the parents, Mr. Bennet is an intelligent introvert with a quirky sense of humor. Mrs. Bennet is an extroverted, lively, vivacious person who cares little about what others think. Elizabeth scored the perfect balance of those characteristics, inheriting her father’s wit and intelligence and her mother’s sparkle and confidence. Lydia is a knock-off of her Mama, with little of her father’s influence to temper her adolescent impulses. That is the tragedy of Lydia to me. Had her father been more involved in her upbringing, she would be less wild. I think those who see a bit of Lydia in themselves would likewise see a bit of Elizabeth in themselves too. It’s fun to note that the women’s fashions of that era were heavily influenced by the military regimentals with details such as frog fasteners and brass buttons, particularly in the spencers and pelisses. The uniforms are cool but I cannot help but wonder how they kept their white pants so white. We recently watched a series on the revolutionary war and those red coats stuck out like sore thumbs plus their uniforms never looked dirty. Pity the poor servant who had to keep those guys in tip tip shape. Thanks for the clarification about the militia. I have wondered the same thing, Jen. I imagine the pants portion of the uniform was cheaper than the coat, so they may have had multiple pairs. Not every regiment had the same styles, however, and many of the regiments had grey or even black trousers. In the images I’ve seen, when they had white pants, they were always paired with hessian boots. The darker colors tended toward being full-length trousers that covered boots down to the foot. If you’re curious about the variations, it’s fun (by my definition of fun) to do a google image search by various years. “British Soldier 1812” for example. They also did have “everyday” uniforms and “dress” uniforms. The picture of Captain Wentworth at the end of the post is actually his everyday uniform. The “dress” uniform was much fancier, with every part — even the hat — trimmed with gold braid. There is a myth about the British red coats – that they chose red because blood wasn’t as obvious on it. The truth is actually much less dramatic. At that time, there were red dyes that were inexpensive, and when you’re outfitting lots of men, you look for ways to save money! Oops. Got my movie wrong… “Taking Chance”. A great movie if you haven’t seen it. As Anji said, I would have to agree that I liked the Rifleman’s green that Sharpe wore. Sean Bean looks good in it. Diana thank you for this wonderful post. Uniforms do command attention. Thanks for sharing these awesome photos. I think you’ve nailed a big part of the appeal. They command attention! I’m glad you enjoyed the post. Enjoyed this post. I hadn’t realized Elizabeth’s attraction to a man in uniform until you pointed it out. The uniform is OK, but give me a guy in a nice suit or even better: riding breeches, boots & jacket. Thank you, Debbie. I think the thing that throws us off with Elizabeth is that she quickly recognizes that having the militia in town brings out the worst in Lydia, Kitty and to some extent her mother, so she expresses her desire for them to leave. It’s sort of a mixed message about Elizabeth’s feelings in the matter, but it wouldn’t be the only time that happens with her. I must admit that Richard Gere in An Officer and a Gentleman certainly inspired something in me ?? so it must be true. Although truth be told he also inspired me in Pretty Woman with no uniform in sight so what does that say???? Lovely post Diana thanks.